I enjoyed reading Laura's recent guest posts (read here) on our blog. From her own experience as a volunteer beach walker she gave a great description of what it's like to rescue a stranded turtle. 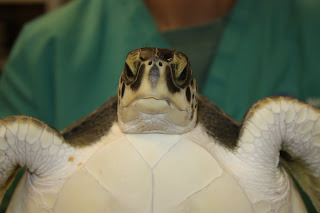 I searched around to see if I could find any more information on beach rescues and I found the video below, which shows our partners at the Mass Audubon at Wellfleet Bay doing what they do best—rescuing endangered sea turtles! Early this season, I had the opportunity to go to the Cape to do a night walk with Bob Prescott, the director of the Wellfleet Audubon that you met in the video above. As Laura stated in her blog, beach walks happen when the tide is high—even if that's in the middle of the night! 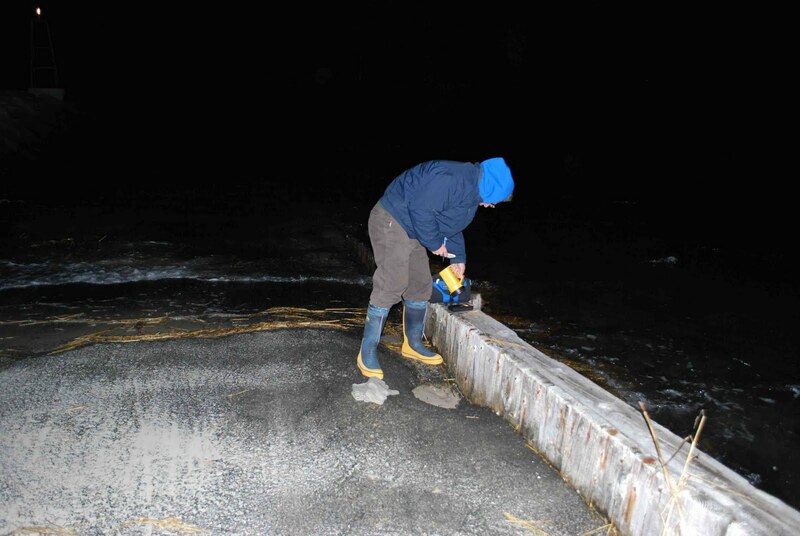 Luckily I had it easy on the night I accompanied Bob as the high tide was at approximately 10:30 pm. I took the photo on left of my car gauges just before I got out to meet Bob. While the temp says 44 degrees the wind chill was much colder. 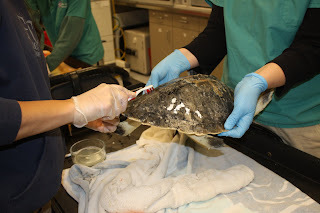 Nothing like the late season temps that the Wellfleet staff endure in order to locate these chilly little turtles. 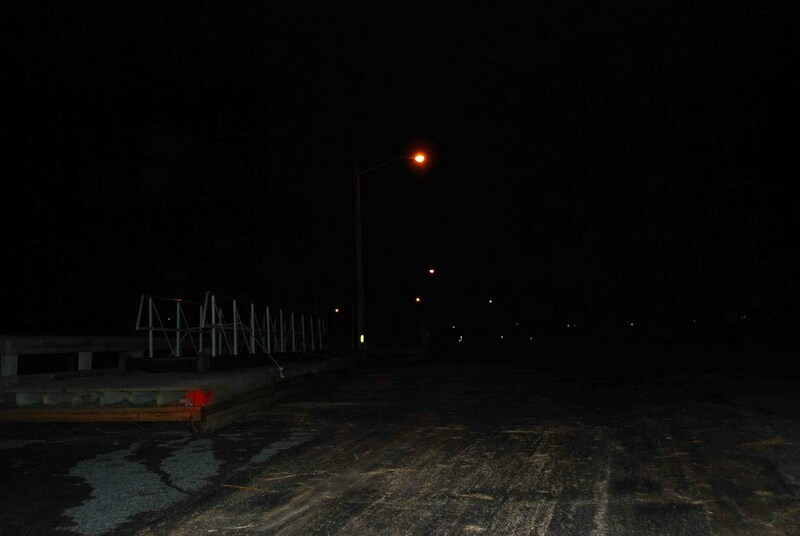 The photo on the right shows a cold desolate beach parking lot with its hibernating docks. 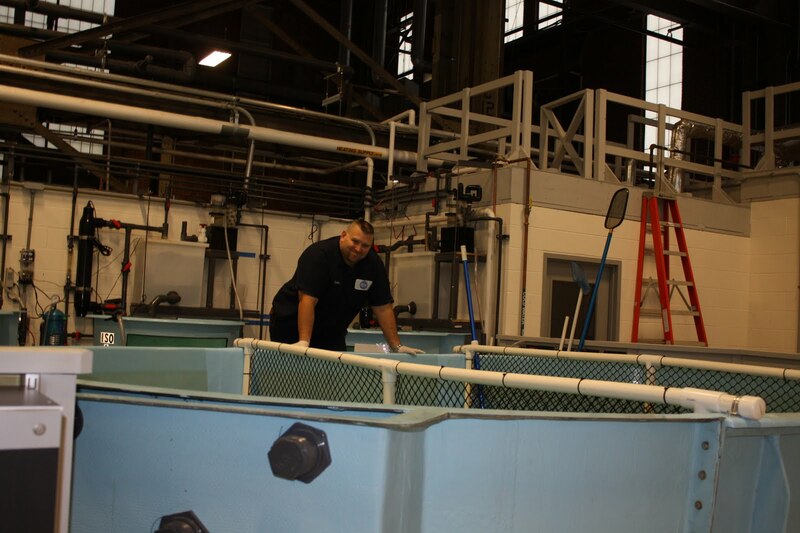 In the photo below on the left Bob takes a quick water temperature reading. The light from my camera flash is deceiving, if you look closely Bob is using his flashlight to read the thermometer. In the second photo Bob records the water temp and other environmental conditions before we begin our search. About two minutes after I took these photos, I went back to the car to put on my rain pants and boots and accidentally knocked my 35mm Nikon camera off the roof of my car and sent it smashing down on the blacktop. I know... can you imagine such a thing?! I couldn't believe it myself. I spent a few minutes trying to get it to work again while Bob finished up, but to no avail. My hopes of capturing our night walk on film were eliminated with a simple clumsy action. Duty called so I left the camera in the car and headed out to search for sea turtles. Before I'd left the house, I took a few photos of a special tool Bob and I tried out for the fist time that night. 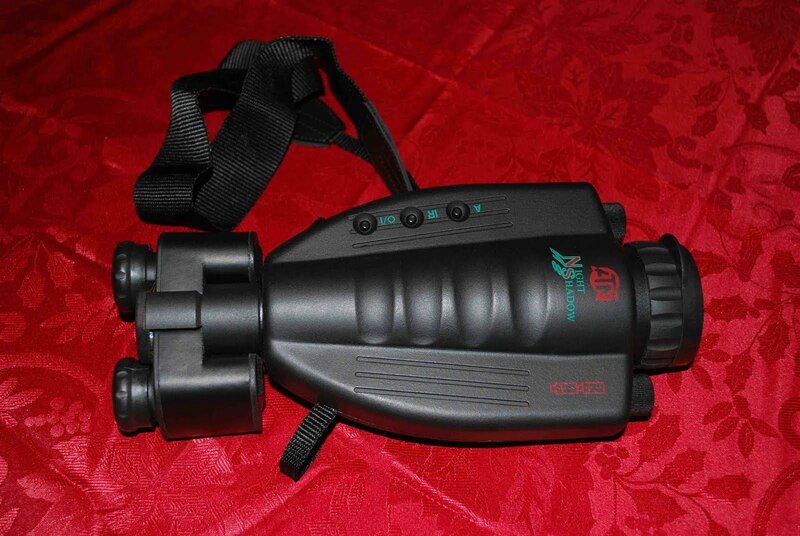 Our new tool was a night vision scope. 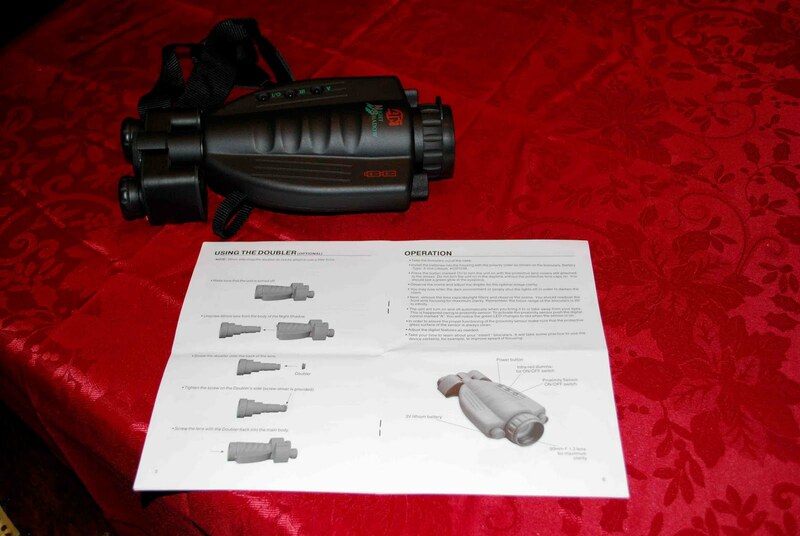 Not just any night vision scope, a top of the line scope donated by best selling author Patricia Cornwell. 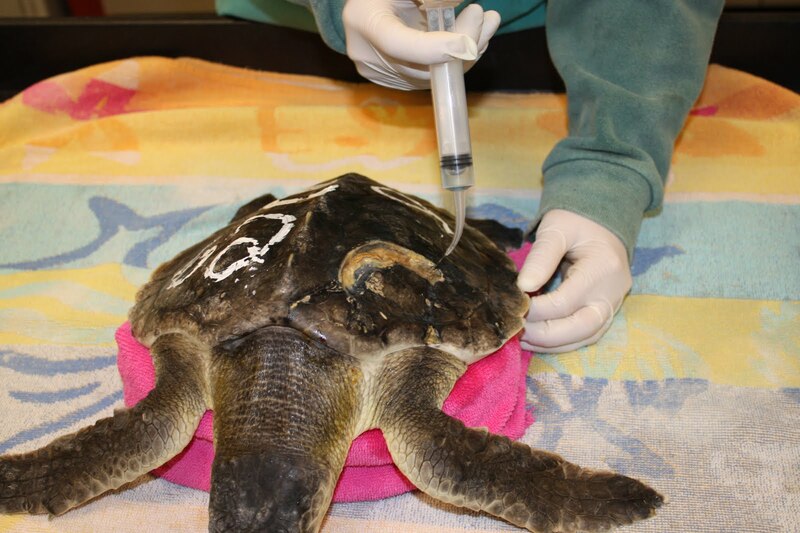 Some of you may remember that Patricia attended our sea turtle release this past summer. I think she caught the sea turtle "bug" while holding one of the turtles for me while I performed a repair job on the satellite tag attachment (she posted photos of the event on her facebook page). Patricia is an animal advocate and gave us this piece of equipment to help locate sea turtles on the nighttime beach walks. How great is that! In the photo below, Patricia Cornwell and Dr. Julie Cavin prepare to release one of the satellite tagged sea turtles. This photo was taken at the release in the summer of 2010. The photo on the left is of the night vision scope, the photo on the right shows the scope and the directions - which I was reading as a refresher before my walk with Bob. 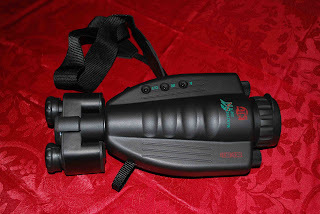 This scope is incredible, it is difficult to describe just how clear you can see in complete darkness. The Scope is still down on the Cape but once I get it back I'll take some night time photos through the lens so you can see just how amazing this really is. 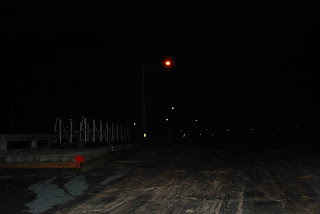 We never found any turtles on my night walk, which was long and cold. Bob is a long time colleague and is a brilliant naturalist and biologist, I kept him busy and passed the time peppering him with questions about Cape Cod natural history (he was a great sport!). We covered three beaches that night and by the time I got home and took a hot shower to warm up it was after 2:00 am. I then did what any rational photographer would do at that hour, I made a cup of tea and worked on my camera. I had it fixed by 3:00 am and then slept like a log. This is a guest post from Aquarium staffer Laura Dill. 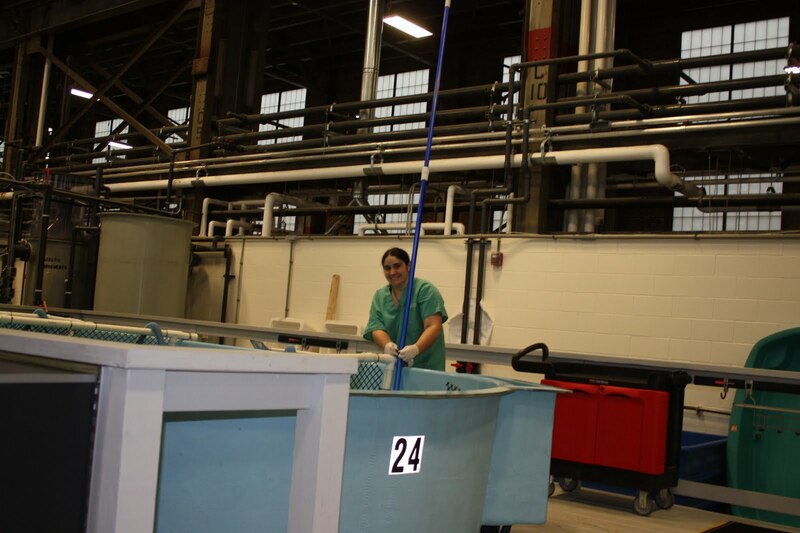 Laura works in the Development office and helps to raise money to support Aquarium programs, like the Marine Animal Rescue Program. 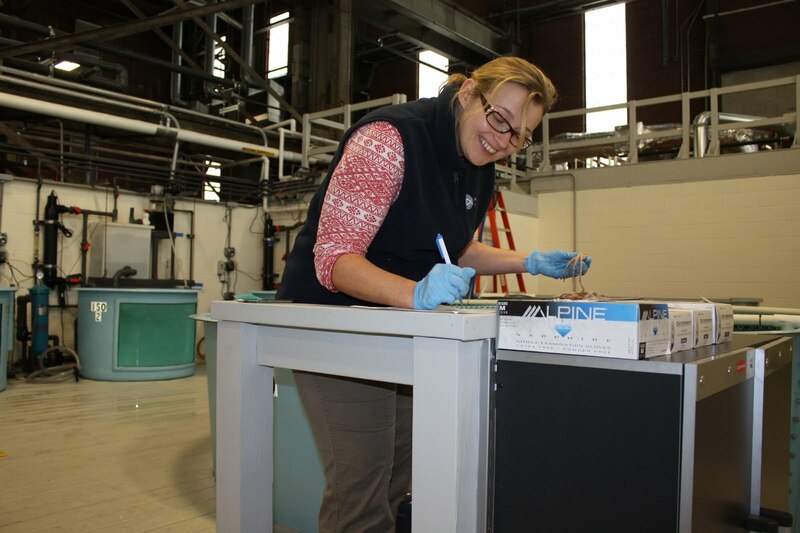 This fall, she expanded her mission to help marine animals to include her off-time! Here's Part One of her experience volunteering to rescue cold-stunned sea turtles from Cape Cod beaches. 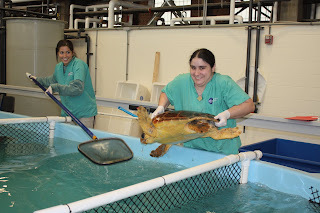 I just moved to Boston from Chicago six months ago for a fundraising position at the New England Aquarium. 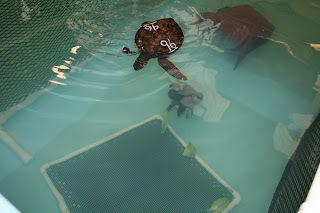 My new position focuses on writing letters to possible donors about our programs, and the first letter I wrote was about the Aquarium's sea turtle rescue program. 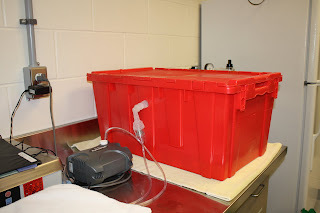 My first thought was, "Wow, here's an organization that actually saves marine animals and doesn't just talk about it." My second thought was, "What a great program, and how can I help?" I contacted Mass Audubon at Wellfleet Bay to find out how I can volunteer to look for the turtles that get stranded on the Cape's beaches, knowing most of those turtles are eventually treated by Aquarium rescuers. 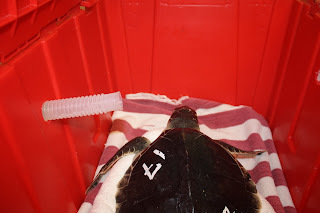 The volunteer manager was quick to let me know the procedure and also to not expect to find any turtles. 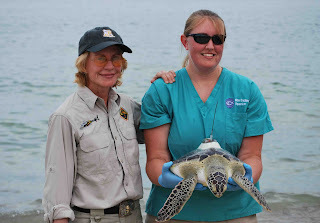 She mentioned some of her volunteers of seven years have been searching the beaches and have not found a turtle. I signed up to look for turtles two full weekends in November, plus the Sunday after Thanksgiving as well as the first weekend in December. 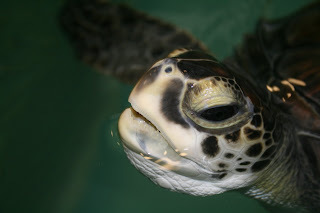 The best time to look for turtles is right after high tide. Unfortunately, high tide doesn't happen between 9 a.m. and 5 p.m. Some mornings I would wake up at 4:30 a.m. and put on my long underwear, socks, old tennis shoes, sweater, fleece, puffy coat, hat and mittens. I had to grab my cell in case I needed to call turtle rescue. I also had my turtle towel in hand. I was assigned certain beaches depending on the wind. I walked Truro, Wellfleet, Brewster and Dennis beaches. The weekend before Thanksgiving, I walked a Wellfleet beach. Before going on the beach I found my stick to help me move the seaweed (just in case the turtle gets caught in it) and I started walking south on the beach. It was about an hour after high tide. What I found was amazing. I found a new respect for the ocean, and it wasn't all pretty. I found dead birds, crabs, fish and a lot of trash. I certainly had been one of those people who just went to the beach to read a book or swim in the ocean on those beautiful 80-degree-plus days. To see the ocean and the beach in a new light was eye opening and made the Aquarium's mission to save the ocean even more important to me. After 10 minutes of walking, I found my first turtle. I was so excited until I saw that his shell was broken and I could see blood. I threw my mittens off and called the Audubon Wellfleet turtle rescue number and spoke to Ashley. 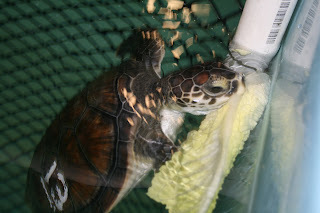 I told her the status of the turtle and since I worked at the Aquarium she trusted me to bring it in. [Click here to listen to an interview with Connie to learn what you should do if you find a turtle!] I placed it gently on my turtle towel and ran as fast as I could to the car and then to the Audubon. I was sad when they said there was no hope for my turtle but on my way out at the exit of the Audubon I saw 5 banana boxes each with a beautiful turtle inside, at that moment my sadness turned to hope. 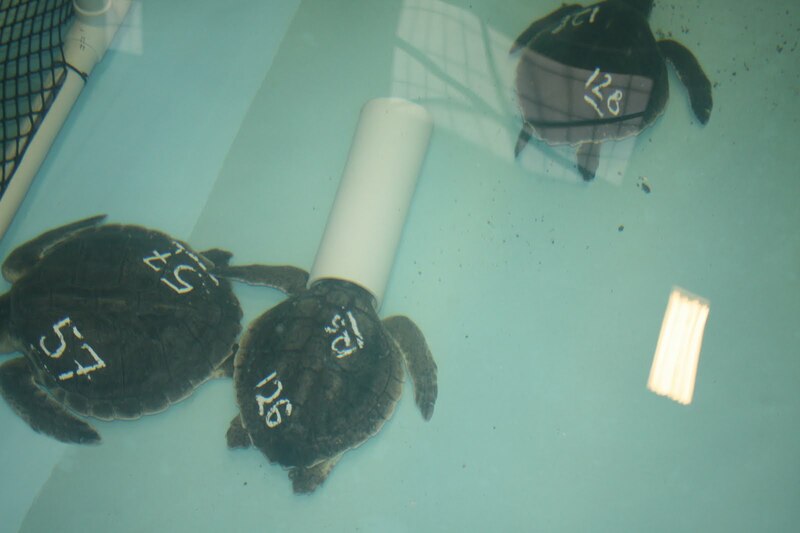 The hope that one or more of these turtles have a fighting chance to survive. 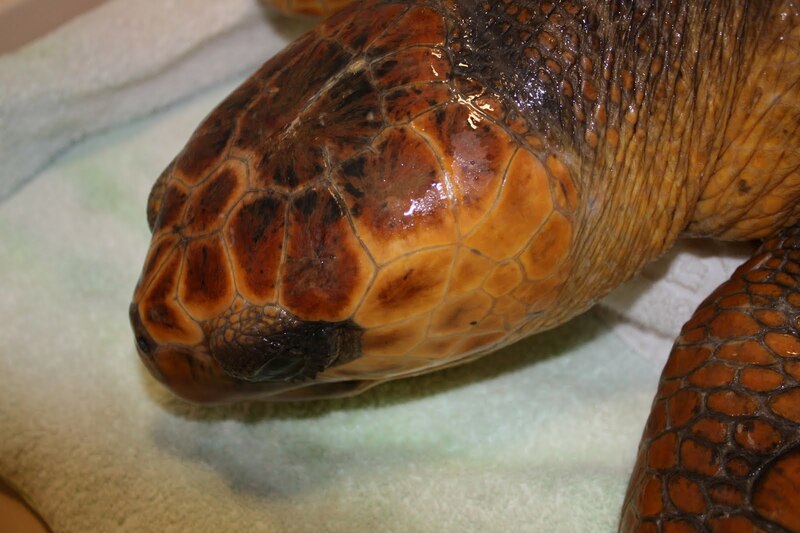 Stay tuned to the Rescue Blog for Part Two of Laura's experience volunteering to search for stranded sea turtles!